GULU – Leaders and residents of Gulu Municipality have raised a red flag over poor disposal of medical waste in the area. They accused private health facilities poorly disposing off medical wastes, putting the lives of residents at risk. Mr. Peter Langwen, the councillor for Library Ward in Layibi Division said medical waste is scattered in garbage collection points in the town something. “We have reported this matter to the public health inspector but no action has since been taken yet this is a big risk to the health of our people once they are injured by wastes or get into contact with them,” Mr. Langwen said. Gulu town currently does not have a medical waste management facility and all medical facilities in the town are directed to dispose of their wastes for incineration at Gulu referral hospital where a functioning incinerator is situated. Mr. Langwen said private health facilities have failed to take the medical waste for incineration at the Gulu referral hospital. “According to the policy, all the medical wastes should be taken to Gulu Referral Hospital where there is a recommended incinerator but since these private facilities are profit-oriented, they avoid the hospital in fear of fees levied on them,” he added. Laroo Division chairperson Moses Abonga said the current state of the dumping site is worrying and the neighbouring communities can contract deadly diseases at any time. “The surrounding communities have already raised their concerns on the matter for fears of contracting diseases related to poor medical waste management. The facility is not fenced and children collect those medical wastes and play with them,” he said. In some areas, the wastes are dumped in drainage since there is no way out, Mr. Abonga added. To him, poor disposal of wastes are due to lack of stringent penalties against business operators without waste collection centers or disposal bins and lack of clear guidelines on recruiting and hiring garbage collectors. Ms. Josephine Acaa, a nurse and operator of a private clinic at Custom Corner in Gulu town, however, said since a locally made incinerator in their village broke down, they have been dumping at Prisons Health Centre III. Some private clinic operators are just stubborn since they continued to dump medical wastes in the open at night despite warnings, according to, Mr. Richard Nyadru Anyama, Gulu municipal health inspector. According to him, such wastes are not supposed to be mixed with general wastes since it bears a lot of risks on the health of the people living in or nearby areas. “We always encourage them to even take their wastes to Prison Health Centre III, where there is a functioning incinerator if they cannot get to Gulu Regional Referral Hospital,” he added. 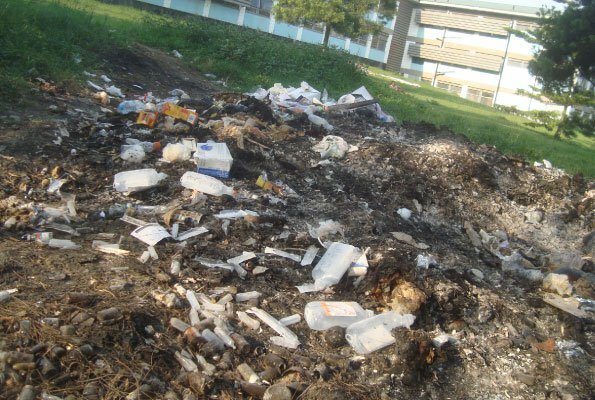 According to National Environmental Management Authority (Nema), the key driver to indiscriminate dumping of medical wastes from health facilities across the country is lack of proper disposal facilities (incinerators). Last year, a ranking by the director of Value for Money at Office of the Auditor General (OAG), Mr. Stephen Kateregga revealed that Gulu town was third after Hoima and Tororo municipalities as the dirtiest towns in Uganda. None of the municipalities according to Mr. Kateregga was able to manage waste in a satisfactory manner since 60 percent of their wastes were either rotting on streets or got washed away by running water to fill up wetlands and nearby rivers. Much as Gulu municipality hastes up for city status, the ranking further hinted that Gulu collected only 20 percent of their garbage leaving the rest to rot on the streets.